Omakase is a Japanese phrase that literally means 'I’ll leave it to you.' 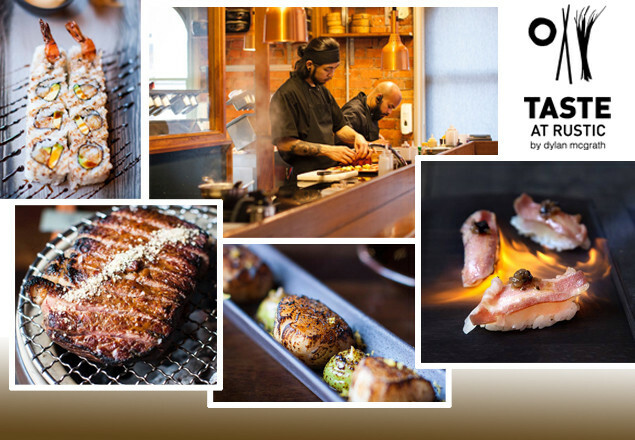 The Omakase menus are chosen to give you the full experience of Taste at Rustic. For €99 for two people, you can experience a four-course Omakase tasting menu, a bottle of house wine and 2 cocktails before your meal in the Bonsai Bar. Real hand sculpted sushi with wellseasoned rice underneath. Sometimes we dab on a little wasabi and we’ve played with the temperatures as well as the various tastes. Done in a Peruvian and Japanese style. These are poached meats in various spices on metal rods. Cooked over Japanese charcoal, I’ve kept these large, to retain more flavour and we’ve used the best meat we could find. It’s often Japanese culture not to finish with dessert, however here we’ve tried to keep them light and take some of their technique to produce flavours that are still relevant.